One of New Zealand’s best-known native birds is the tūī, Prosthermadera novaeseelandiae. I photographed this one on February 8th on the island of Tiritiri Matangi, which has been turned into a wildlife sanctuary and nature preserve. For more information about the tūī you can check out New Zealand Birds and the similarly named but independent site New Zealand Birds Online. That’s a great name. Since you’re in Australia now, I wonder how many people who see her middle name know that it’s this bird. Vive la différence, and what a difference a few years made for your daughter. See the comment down below by Sherri of Palm Springs. Wow!! This is beautiful bird. Thanks. You’re welcome, Isabel. I never expected to be able to get this close, but that closeness let me record the bird’s features in detail—though with difficulty, because it and others of its kind kept chasing each other around and wouldn’t hold still for more than a few seconds at a time. I like the chin tufts and the blue color. How big is the Tui? The two sources I looked at both say 30cm for the male. The white chin tufts on a dark head seem to be the inspiration for a vernacular name in English: the parson bird. I was surprised to end up with more good bird photographs in New Zealand than I do at home in Texas. Wildflowers are a lot easier than birds because they don’t fly away when you try to get close. When a bird is far enough away or in a place where it feels safe, I’ve sometimes been able to put a telephoto lens on my camera without scaring the bird off. Whether I’ve then been able to get closer and take good pictures is another story: sometimes yes, often no. I like the sound of it: photographer-ambassador, a new version of the ambassador plenipotentiary. If you have any potent connections in Air New Zealand, please suggest your idea to them. Sigh, I wish I did have connections. This reminds me a lot of a grackle that I photographed yesterday, but this one definitely trumps the grackles with its white tufts! And if your grackles are similar to the ones in Texas, the tūī trumps them in color as well. If you got a good photo of your grackle, or if you plan to paint it, we expect to see it eventually in a post. Yes, good photos! It landed on a limb about six feet from me, and the camera was within subtle reach. After the bird flew away, I pondered the ‘what if’s’ and decided that a female grackle probably boasted a rainbow of colors once upon a time long ago, but it was too vain and wanted more.. she kept adding colors until they all mixed and became mud… the fable needs tweaking, but it gave this highly-creative mind a fun little run! A little fun run down there in the sun. Do tweak your tale, which has the makings of a children’s book, illustrated by yours truly (i.e. you). si, one of the blessings of a creative mind/eye is also its curse.. which ball does one drop in order to pursue other creative whims? little interactions trigger little ideas that play out in a few seconds and it’s sometimes fun to allow them time in a spotlight. thanks for your nudge on that one – it would be a fun and fast story. i’m working on a more complex one and much more serious regarding our planet and what we’re doing to it. target audience is the children, who are inheriting a big mess we’ve made of things. Let’s hope you put together your fun and fast story as well as the more serious one. I saw the grackle in your queue and by Texas standards it looks quite grackleish. And yes, I understand about having too many irons in the fire. For decades I’ve had a bunch of “main” interests and therefore have spent less time on each than if I were more narrowly focused. it would be nice to have identical clones to split off into each interest and explore and learn then come back and report to the primary person! There’s another little fable for you to write and illustrate. 🙂 so many ideas and so few hours in each day! Well, ain’t he a beaut! Love his little ‘beard.’ Did you add many new birds to your list of regulars while you were away? I’m rather fond of my ‘little collection’ and actively look to add another to my shelf. Great shot, Steve. Got his personality! In Austin I’m not a purposeful bird photographer but I always carry a 280mm (equivalent) lens in my camera bag just in case, and a bird does come my way every so often when I’m out photographing plants. The same was true during my four weeks in New Zealand, but I ended up with more birds than I thought I would, and more than in that same amount of time in Austin. With today’s picture I’ve showed five and I think there are at least two more to come. and keep scrolling, you’ll see the five NZ birds and then the ones from Texas over the past four years. If I headed to some of the wildlife refuges closer to you near the coast I could probably up my Texas BQ (bird quotient). Oh, you lucky thing! I only managed a very poor shot from a distance of one of these birds. I saw plenty of blue flashing past, but none that settled near me. I love the pose! This is such a great photo Steve. I appreciate your enthusiasm about the photo, Jude. I was shooting at 1/500 sec. to try to stop the action while still having reasonable depth of field to keep important parts in focus. I managed to get some other good pictures of tūīs during the 15-minute session, but this was the only one where I caught a bird with its body in a downward attitude, and that’s why I chose to show it. Thanks. I was pleased with it. A great photo. I love the detailing of the white feathers – that is why it is called the Parson bird. They look like a white tie or colour under the beak. Thanks for your clarification about the detailing of the white feathers and the alternate name it led to, which I never heard anyone use while I was in NZ but which I found in one of my online sources. I can certainly see the white tie. No, the moniker comes from the early settlers to New Zealand. There has been a shift away from that name back to the Tui. Right, and I take that to be part of a broader return to native things and native names for them. Indeed. Some of the words I encountered were iwi, tane, wahine, pa, whare, and mana. Nice. Reminds me a bit of our common grackle. Lisa (Playamart) in Ecuador said something similar. I checked online and found that in spite of that resemblance grackles are in a different biological family from the tūī. I hope I don’t remind any of my former students of a bird, no matter how colorful. What you say about mismatched parts reminds me of the reaction that scientists in Europe had when settlers in Australia sent back the first preserved platypus specimens; the scientists thought the settlers were playing a prank on them by sewing together parts of different animals. What tales: from the things you’ve said, I’d be very wary too if I ever spent time out there. I’ve alerted fluidicthought to your comment. Tui certainly is a distinctive name. The colors are beautiful, and so is the variety of feathers and their arrangement It’s neat that you captured one of the white shoulder patches, which one of the linked articles says usually is hidden, except in flight. That same article says that the bird usually flies with its head higher than its tail. Here, you have it in a very non-flight pose. With all of the singing and chittering and rasping, sunrise and sunset must be terrifically musical there. While the tūī may fly with its head higher than its tail, I have the impression that that from the stance shown here the bird was about to take off. I wish I could be back there and observe for a while to confirm that, because at the time I was too busy trying to get pictures to observe much of what was going on. I didn’t see any instances of the display flight you mentioned, but I did hear a tui singing in the early morning outside the house on the Whangaparaoa Peninsula where we were staying, including on the last morning in New Zealand. I wouldn’t have known what kind of bird was making that sound, but our New Zealand host identified it. Thanks, Sarah. This was my first encounter with any tūīs, so I was pleased to get some clear and close photographs. It was. There were several of them and they kept chasing each other away from the source of food and water. It is a wonderful image with loads of color and nice sharp feather detail. Those tufts are very interesting as all the tufting on birds round here is on their crown!! The variety in the world of birds is marvelous!! Love this guy! Not being generally a bird photographer, I was surprised and pleased that I managed to get more good bird pictures in New Zealand in four weeks than I probably get in Austin in a year. The tufts, as you couldn’t help noticing, are the main distinctive feature of the tūī. I hope you’ll get to see a live one someday. Oh me too, but ’til then, thanks so much for the vicarious view!! I hope you had a very vivid vicarious view. Oh yes! A very verifiably vivid virtual vicarious view!! And a verisimilitudinous one, I hope. I know I’m way late on this again, Steve, but the thumbnail in your Top Posts caught my eye and I had to follow the link back to this. And, having done so, I have to tell you how much I like this great portrait shot and that they are among my very favorite NZ birds. I spent a wonderful day on Tiritiri Matangi too, and still highly treasure the experience. Thanks, Gary. I’m not normally a bird photographer (no enormous telephoto lens in my arsenal), but I surprised myself in New Zealand by getting several good bird pictures, something I don’t manage nearly as often in Texas. Visiting reserves there accounted for some of my success because native birds were present in goodly numbers and I suspect at least some of the birds were more used to people than would be the case in the wild. I’d read about Tiritiri Matangi in preparation for my trip, but not till we settled in at Eve’s niece’s place on the Whangaparaoa Peninsula did I realize that the ferry to the island departed from a spot just a few miles from where we were staying. A spectacular shot of such a gloriously handsome bird! I may have to try to draw this one, with your permission if you’re willing, of course. Yes, yes, go for it! British colonists called this a parson bird but New Zealanders have gone back to the native name. Hello! I’m from Dunedin NZ. 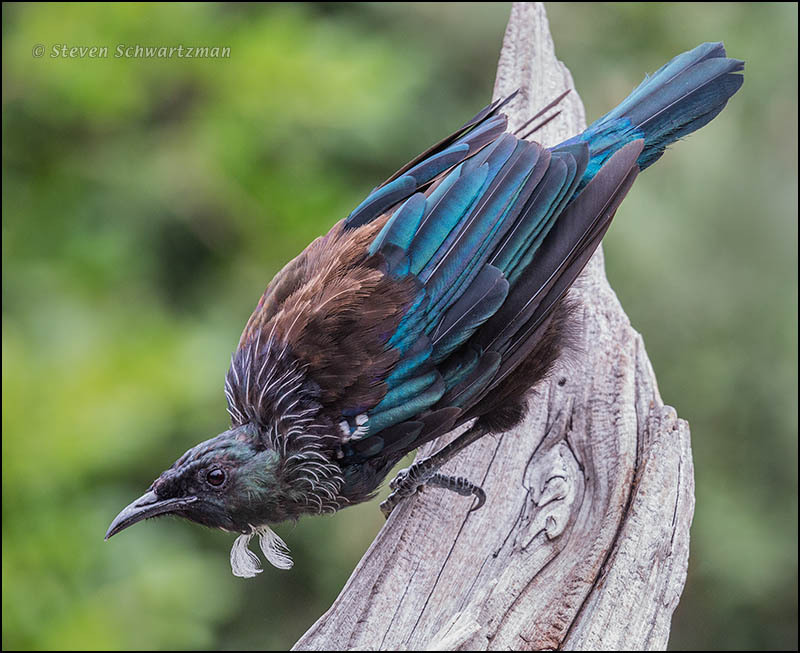 You’ve captured the colours of the tui beautifully, not an easy thing to do. I’m hoping to do a WP blog post in the near future on Blue. Would you permit me to use this photo as one of 6 or 7 images that I’d present on my post with links back to this post and to your blog? Sure, as long as you include the links back to this blog that you mentioned. Thank you. It will be a pleasure to share such a lovely tui photo. I enjoyed the adult bellbird shot, it looks like you captured it while it was singing! Very nice. I’m not a dedicated bird photographer but I got a few bird pictures during the three weeks of that NZ trip that were better than what I normally get in a much longer period in the US. Maybe it was the excitement of being in an exotic place. Bellbirds and tuis don’t usually sit still for long so I was surprised you got such good shots as a visitor. I’m glad you had such a good experience! Thanks for letting me know. Happy blue to you.